So why do we travel? I started this trip thinking that I would discover insights into the answer to this question. I thought that through pushing myself to do things that frightened me, challenging myself physically and mentally, and seeing the spectacular scenery and incredible wildlife and plant life, I would discover a few gold nuggets of truth that would maybe shed a small bit of light on the answer. Today is Thanksgiving in Canada, and we are very far from home. 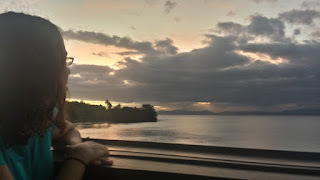 I'm writing this as we sit under dim lights on an outdoor patio, waiting for our dinner on one of our last nights in Fiji, as the wind blows the palm trees and rustles the beautiful greenery all around us. I'm writing this in advance, but will only post it once we are back home, safe and sound. We've encountered several challenges on this trip - the wrong turns in the dark while traveling through New Zealand, watching mysterious cars appear and disappear outside our small campervan window in a secluded camping spot, not being able to find camping spots at all, hiking unexpectedly in the dark through the hills of a Fijian island, being thrust into a village culture with customs we couldn't guess or understand. We've weathered it all with grace, allowed ourselves to relax and laugh about them, even while they were happening. We've been exposed to so much that we had never seen or felt. We've encountered emotions, strengths, and weaknesses in ourselves and in each other, and learned how to balance our skills in order to counterbalance the others' weak spots. We've seen how other people live in a manner that is very different than our North American experience. We've seen how fragile the environment can be. We've seen how resources like power, water, and heat can be very limited and precious, especially in undeveloped countries like Fiji but even in relatively developed places like New Zealand. We've seen how people can live with so little, or with different 'basics' than what we're used to, and still live full (if different on the surface) lives. The world has seemed simultaneously strong and fragile to us as we've journeyed through remote places like Milford Sound or small traditional Fijian villages. We are thankful for what we've seen. We are thankful for the chance we took to scrimp and save in order to come on this adventure. In my case, I am thankful for the wild chance I took on such a long leave of absence and the possibility of not having an income right away when I returned. We are thankful for each other, on those long hiking trails when we couldn't go another step until the other reached out a hand; for the dark nights when all we had was each other's company and the stars; for the immeasurable kindness, friendliness, and genuine helpfulness of almost everyone that came across our paths, whether in New Zealand or in Fiji. From the convenience store owner who explained to us how to maximize our gas points in New Zealand in order to save as much as possible; to the grocery store clerks or tour ticket sellers that would give us discounts "just because", to the anxious kindness of everyone in the village we stayed in to make sure we were comfortable, to the helpful hands held out in Fiji to guide us across tricky river or boulder crossings. We were floored by the kindness offered to us as strangers, and the constant welcoming of us as "family", especially in Fiji. Sometimes things happen, whether while traveling or at home, that can pull the rug out from under you. As I write this, a fellow traveler at our resort is sobbing in her boyfriend's arms after just hearing on the phone that her grandfather has passed away, thousands of miles away. J herself had to miss her grandfather's celebration of life ceremony. I remained mostly unscathed from heartache back home, except for a highly distressed cat which broke my heart every day to hear how unhappy he was without me. Last night, J and I were fast asleep in our treehouse, when some rustling woke us at around midnight. The noises moved out of our room and into the adjoining room, and I saw a shadow. After some whispering back and forth with guesses of what animal it could have been that had gotten in, we realized a couple of items had been moved and some money that had been in plain sight was missing. We quickly realized that the individual must have left through the front door (not visible to us from the bedroom) once we woke up and started whispering, but it was quite a frightening experience, knowing someone had been in our room while we slept. Thankfully, they only wanted cash, and left everything else intact. The resort provided security to our treehouse for that evening and the next one (our final), and kindly offered us dinner and drinks on the house that night. It wasn't a lot - just under $200, at most. Apparently other resorts in the area were also targeted that same evening. The manager reported it all to the police, but, as he put it - "It's the Fiji police, I highly doubt anything will be done". It doesn't matter. What matters, of course, is that we're safe. Our passports were untouched, as were our cameras and my laptop with the photos and memories of our trip. The next day, we went on our planned waterslide trip anyway. You can let life throw you down, or you can continue on and grab hold of whatever joy you can, and that's what we did. Later, back in our treehouse, we opened up all the curtains, let the light in, sat in bed playing a card game, and ate pieces of Smarties chocolate bar - the treat that has been with us through the entire trip since Day 1 in Auckland. We looked at photos of our trip and reminisced. We made the place ours again. Who knows who or why it happened. This is a country where access to basic necessities can be difficult. People see wealthy tourists come and go every single day, while they work at minimal and unstable wages, often far away from their home villages and people they love. Or maybe it was a kid just for fun or the thrill. We don't know. It doesn't really matter. It's just money, and we're safe and unharmed, and we're heading home to friends and family that we miss and love dearly. So we are thankful. For a home to go back to, for jobs and income, for friends and family. We are also thankful to have access to hot water, fresh vegetables, consistent garbage pick up, 24-hour power, and relatively inexpensive and freely available internet access. We are thankful to be returning home with hearts full of memories. I think I've realized that there is no answer to my initial question, and that framing it as a question is a falsehood. There is no meaning in the question 'why do we travel', because there is no answer, no final end on the journey. The desire or compulsion seems to be deeply embedded, but there does not appear to be a satiation of that desire. This will be J's 33nd country, and my 10th. Every footstep we take in a new place or culture is a brand new adventure; a brand new experience; a brand new challenge; a brand new joy or sadness. We're not seeking any end goal at all. We're simply doing what everyone else does - live. Take in every moment, every inch of the globe, savour it. We're giving ourselves over to insecurities, to dreams, to the unknown. For somehow, we know that these experiences will shape us, change us, fulfill us, in ways we cannot possibly fathom. We have sun-drenched hearts full of stories. Some we will tell and re-tell; others we will keep to ourselves. A friend of mine once said that all the experiences had while traveling are like currency - jewels to hold and examine over and over in the dark winter nights, in the periods in between travel, in the moments we lose ourselves to sadness or the grind of the everyday. I shared my experiences through this blog as a sort of gift to those that could not be with us. I wanted to take you, dear reader, with us along for the ride. Give you a taste of somewhere you may never go; a glimpse of a journey you may never take. If I could, I would siphon off a piece of the midnight sky studded with stars over the still of the mountains and put it in a bottle and give it to one of you. To another, I would take "the bluest blue of the blues" in Lake Pukaki and paint everything blue in your life with it, that you would know this shade that exists nowhere else. To yet another, I would weave all the tired exhilaration and incredible views of all the hikes we did into a soft scarf, so that when you wore it around you, you would have that majesty forever present. And for the rest of you, I would take a single drop of the delight at seeing the rarest penguin of the world come out of the sea, and infuse every image of every creature every one of you ever saw with that delight, so that you would always feel that wonder. But I can't do that, so my words and stories; my and J's photos and videos, must suffice. Maybe we will inspire someone, somewhere, to take the incredible journey we did, or their own. Maybe we will just inspire people to dream bigger, to challenge themselves, to take that final leap into something they've always wanted. We are safe, we are happy, we are home. Happy belated Thanksgiving, Canada. We've missed you. We took a break from activities and sightseeing in Taveuni and decided to spend a day relaxing. We spent a lazy morning in our treehouse watching the beautiful view from our lovely room, sitting on the porch in the sun blogging, and having a leisurely breakfast. Eventually we made our way out of the treehouse and headed towards Prince Charles Beach, known as the best beach on Taveuni, and only a ten minute walk from the treehouse. The beautiful little patch of pristine sand and rock-free shores made it a perfect place to spend the afternoon, and we enjoyed swimming and playing in the crystal clear blue waters, resting in the sun, and swimming some more, until it was dinner time. For dinner we headed a few minutes up to the road to a restaurant we had read about online, called Tramonto. Tramonto is supposed to have the best pizza on Taveuni, and we read that they will even deliver your pizza right down to you on the beach. However, they also have an incredible hill-top view of the ocean, perfectly angled for the sunset, and we wanted to experience this. As an appetizer we were brought some breadfruit "chips" and a spicy sauce to dip them in, which were quite tasty. The lovely ladies in the kitchen made us a delicious thin-crust chicken barbecue pizza with garlic, tomatoes, and a sweet/savoury/spicy balsamic drizzle to pour over top. Add in some ice-cold Fiji Gold beers and a beautiful display of gold, pink, and purple sky over the ocean, and it was a perfect evening. The next day started off with a little rain (which Taveuni sorely needs as it is going through a drought right now), but the skies soon cleared up for our planned visit to the natural waterslides. We were accompanied by three other guests from the hotel as well as a local guide, for it is difficult to experience the waterslides properly without some local knowledge. The waterslides are essentially a series of small waterfalls in a long river over smooth and slippery rocks that you can literally slide down like a waterslide. However, it takes a local to know the safe places to slide, as well as how to use your body as a makeshift "dam" for a few minutes in certain spots in order to create a better rush of water for your slide if it hasn't rained in a while. However, before we reached the slides, we were taken to a local small town and had a chance to be amongst the locals doing their everyday shopping. The fruit and vegetable stands had many things to chose from, and I purchased a ripe looking mango to try later. Our guide used the time to pop in for a quick hair cut. Multi tasking, Fiji style! We then headed off towards the 180° meridian marker. This line passes through very few points of land, and Taveuni happens to be one of them. In theory, you can stand with one foot in yesterday and one in today, but the time zones have been shifted slightly in order to keep all of Taveuni within one time zone. It was still an interesting and fun experience and we took turns taking photos of us "with a foot in both days", or with one of us standing in 'yesterday' and one in 'today'. Finally, after a very uneven and wobbly ride in the 4WD on a long dirt road, we arrived at "the white house" - a local's home nearby. We were unsure who's home this was or why it was included in the trip, but we were allowed to use the unlit bathroom in their humble home to change into our bathing suits. "How far is the walk to the waterslides?" J asked the guide, wondering if she should take her sturdy shoes or if flip-flops would suffice. "Oh, it's just five minutes walk, right there beside those palm trees," he pointed. At least ten minutes in, as we were tripping on vegetation and sliding down barely-there trails slippery with rocks, J mumbled "Never trust a Fijian person when they say something is just five minutes away", as we both tried simultaneously not to fall and keep up with our guide bounding away up ahead. Once we reached the river, he did stop and assist us with a tricky river crossing over some boulders. However, the narrow trail down to the perfect access point to the waterslides was blocked by a small wasp's nest dangling in the path from a tree branch. Our guide said some words we didn't understand, and bounded away back the way we came, soon appearing on the other side of the river, and seeming to make a ten minute hike in just thirty seconds. Less than a minute later he was back, carrying a lighter and a bunch of long dry palm tree leaves. We watched in fascination and confusion as he lit them on fire and proceeded to set the wasp's nest on fire, but not without receving one wasp sting before he was done. The path now safe for us to continue, we followed him down to the water's edge as he hopped into the river and showed us what to do. Excited, we followed him one by one and slide down several of the "slides" in the river, some of them longer and faster than we had anticipated. The rocks were indeed very slippery and it all made a perfect "slide". There was the occasional bump against the rocks or the speed turning you upside-down, but it was all part of the fun. The deep pools of water that you ended up in after each "slide" were very refreshing. The purity and unspoiledness of most of the land in Fiji fascinates me. "Do you want to go again?" he asked us. We all excitedly said yes! So we climbed over the rocks and down the trail back to the beginning and had one more series of fun slides down the river, while he kindly took photos and videos of each one of us with all our cameras. We reluctantly headed back to the car after that and were driven back to the "white house" where we sat outside enjoying the incredible panoramic views of the ocean and lush green hills all around us while eating our generous packed lunch of chicken, vegetables, rice, and "lemon juice", included in the cost of the tour. Two little boys that lived in the house came out to play on the hammock nearby, and I was amazed at their play. They couldn't have been more than 4 and 6, and they swung, climbed, stood on, and pushed that hammock with each other on it in ways that would make most North American parents panic and rush to save their children from peril. But these children were extremely good at what they were doing. Their physical dexterity amazed me, as they kept their balance impeccably and with the obvious skill that comes from years of practice learnt from trial and error experiences without anxious adults hovering to protect them from small harms. Our guide also dropped off two young boys on our drive back to our accommodation, and these small children were simply left at the side of the dirt road and expected to walk the rest of the way alone to where they were going - something else that would rarely ever happen back home. Everything here happens not only on "Fiji time", but also "Fiji style" - drive by a friend on the road who's going the other way and remember something you have to tell him? No worries, both drivers will just abruptly stop their vehicles mid-drive and back up towards each other in order to have a short conversation before continuing on. The next day was our flight from Taveuni back to Nadi (where we would catch our series of return flights back home the next day), but it was only at 4:30, so it gave us plenty of time to join another guide-led activity the next day - a visit to the famous Rainbow Reef for a morning of snorkeling. After a relaxing 45 minute boat ride (during which I was startled to see a "flying fish" leap out of the water and "fly" a couple of feet before diving back into the ocean), we arrived at the Rainbow Reef. After putting on our gear, we slide into the water and followed our guide as he swam and snorkeled his way along the reef. I was utterly fascinated by the amazing rainbow world underneath me. All different shapes, sizes, and colours of coral were everywhere, and each swim forward brought something new and incredible. And then fish - I can't even describe the beauty. Medium sized yellow ones, long and thin orange ones, black-and-white striped ones. And the blues! Iridescent blue-green-purple fish all around us, sometimes entire schools of them. At more than one point, I looked over and saw J swimming WITH the fish. Beautiful. What an amazing world just under the surface of the blue water. My favourite of all was the three Regal Tang fish we saw. Incredibly blue, with bits of yellow, there they swam, with no concern over our presence, just allowing us to watch and marvel at their fascinating and bright colours. After about 40 minutes of viewing the beautiful Rainbow Reef (it certainly lives up to its name), we hopped back in the boat for a short ride over to a nearby deserted island where we would eat another delicious packed lunch (this time, vegetable curry with rice and, of course, "lemon juice"). It was incredible fun to just lounge around on a stunning beach of white soft sand, no other humans on the island but us, and nourish ourselves after that exhausting swim (we encountered some strong currents towards the end). It was the perfect end to our Fiji adventure, and we were back with plenty of time to hop on our scenic tiny-plane flight back to Nadi. Later that night in our hostel room, the reality of the trip being over started to sink in. Initially, being away for 38 days seemed like so much time to be away from home. But I think I've caught the travel bug. I could easily keep going - and so could J. Part of our return flight involved going to Auckland first, and a week ago I asked J, "Would you get back in a campervan in Auckland and do it all again?" "Yes", she said without thinking. "I would too." There's something about travel. The open road, the unknown, becomes comforting and familiar. It forces you to live in the moment. As we arrived in the Auckland airport to wait for our flight back to Toronto, I got to glimpse some of New Zealand's rolling green hills one last, brief time. I loved experiencing the culture and unspoiled islands of Fiji, but something about New Zealand crept into my heart and made those rolling green hills seem like a glimpse of a familiar home. The kiwi accent in the airport, their refreshing sense of humour and lightheartedness as we wandered around the airport, the post card images of all around the country, and the familiar "Kia Ora!" greeting, all felt like uncannily like a brief homecoming of sorts, before returning to our real home. J saw the look in my eyes. "We'll come back," she promised me. And I know we will. But for now we are weary backpackers, and being on this flight home is bittersweet. The open road has ended for now, but we're looking ever forward to new adventures, new dreams. Thank you to everyone that has followed along with our journey. Knowing that there were so many people out there not only reading, but waiting for the posts to come, helped me stick with my commitment to write about the entire trip, and inspired me to reach inside for my true feelings and to find the right words to convey them. I'm posting this from Vancouver as we wait for our final connecting flight home, but I do have one more final post regarding the trip that I will post once we arrive home, so stay tuned. Goodbye New Zealand, goodbye Fiji, goodbye open road... Toronto, we'll be seeing you very soon. Our hour-long flight over to the island of Taveuni, Fiji's third-largest island was a sight-seeing event in and of itself. The tiny 18-seat plane offered us a novel way to experience the sights of Fiji. We flew over part of the inner terrain of the main island, part of which is a national park, and then continued heading northeast towards Taveuni. We admired the magnificent turquoise, blues, and greens of the coral reefs seen from above, and saw some more of Fiji's other 333 islands. Our plane! With the pilot, for scale. After this thrilling flight (turbulence takes on a whole new meaning in a tiny plane like that! ), we landed in the Matei airport, which is pretty much just a small shack. Our driver from our booked treehouse accommodation was there to met us, and after a mere two minute drive, we arrived at Maravu, the resort that our treehouse was adjacent to. After checking in, we were driven over to the treehouse and the staff kindly carried our heavy backpacks up the 76 stairs. As we climbed the stairs, I got more and more excited by the wonderful place I could see emerging through the trees. "It's beautiful!" was all I could say when we got there. The staircase ascended up into the tops of the palm and fruit trees, and brought us up to a very large deck with two reclining chairs and a gorgeous view over the trees, gardens, and out to the sea. Inside the treehouse, we were greeted by a wall of glass doors offering us the same views as from the deck, a beautiful bed with these same views, and plenty of cozy chairs to sit in, some day beds, and several showers with beautiful grey stone floors - including one right outside on the deck! After over a month of traveling from one place to the other, living out of our backpacks, it felt like such a luxury to be able to relax in this beautiful space for four days, unwind, and settle into our last four days of Fiji. We had so looked forward to our treehouse, and we were finally here. After dropping off the rest of our things, we headed back the staircase through the trees and took a short walk to the main road in search of the beach. We found a small patch of beautiful sand and palm trees, and sat there as we watched the setting sun play colours of gold and orange over the ocean. Sometimes the best way to experience a country is just to sit still and enjoy quiet moments like this. They have become second nature to us. We let the universe show us where to go and what to do quite often, instead of pre-planning. In other words, we let life surprise us. The next day, October 10, was Fiji Day - Fiji's celebration of independence. Fiji was ceded to the UK on October 10, 1874, and then regained its independence on the exact same date in 1970. Everyone here is very proud of their independence. As we were having breakfast down in the main resort, they invited us to come and join them as they sang their national anthem, and handed us some Fijian flags to wave as they sang and played. Later on in the day, as our taxi driver drove us to the Bouma waterfalls for our hike, people in the streets called out "Bula!" and "Happy Fiji Day!" as we drove past. The Bouma waterfalls are located in Taveuni's National Heritage Park and are also known as the Tavoro waterfalls. We had seen pictures of these three waterfalls before coming to Taveuni and were enthralled by the beautiful photos of people swimming in them, so it was a must-do while we were here. The hike to the first waterfall was only about ten minutes, but we didn't stop to swim in it, as we had the goal of making it to all three waterfalls first, and it was an hour and 40 minute hike to the final one. We enjoyed the lush green jungle-like terrain as we ascended slowly upwards. Some points required river crossings, but there were plenty of boulders to step on and handy ropes to hold on to as you went. After the tiring hike, we were more than ready to jump into the final waterfall's pool. It was a little cold, but very refreshing and the most perfect reward after the trek to get there! It was so much fun to swim under a waterfall. The last falls is actually three falls cascading into the same pool, and we enjoyed swimming between all of them in the clear water as the falls crashed down around us. At one point, we saw some locals jump off a very high rock above the falls and down into the pool. It looked like a lot of fun but also really scary. We decided to try and jump from some rocks that were a bit lower. The chosen jump-off point involved needing to first jump out and away from some boulders that were close to the jumping place, and J's attempt at doing this ended up in a painful-looking belly flop into the pool below. I didn't quite trust myself to be able to jump away from the boulders that much, so I selected a much lower jumping point for my jump. Still fun, and not as scary! After swimming there for a while, we started the hike back to the first waterfall, which went much faster, and then went for another swim there. As I lay in the waterfall pool on my back and looked up at the high water falling just beside me, and the lush greenery everywhere I looked, I marveled at how deeply rewarding this simple experience was, and how much joy a simple swim in a waterfall could give me. A completely different experience than simply being in a swimming pool. There's nothing quite like being totally surrounded by nature's greenery during a refreshing swim. I felt like a child and just enjoyed the pure sensory experience of it. the third falls at the end of the trail - completely on their own! We reluctantly left the waterfalls and headed back to our waiting taxi, who drove us the 20 minutes through Taveuni's dirt roads back to our lovely treehouse for an evening of rest in our idyllic place among the trees. After leaving Navotua, we boarded the Yasawa Flyer once again to island-hop from the north end of the Yasawa group of islands down to one of the most southern ones, Waya LaiLai, to head to our next booked location, Naqalia Lodge. We enjoyed another scenic boat ride with beautiful views of the islands before arriving at Naqalia in the late afternoon, to the friendly welcome of men playing guitars and singing to us as our boat pulled onto the beach! We were given an orientation session to Naqalia with one of the very friendly owners. He explained that the entire property is owned and managed by his entire family and extended family - him and his wife, siblings, uncles, aunts, nieces and nephews. It feels really nice to be supporting local families during our travels, and getting more of an authentic Fiji experience than if we had just done resorts. He also gave us a rundown of the extremely dangerous creatures that live in coral reefs, such as giant clams that will clamp down on your foot or spiky sea creatures that cause extreme pain for 8 months if you happen to step on them. The message: Don't walk out too far and don't walk on the coral. We had a beautiful place with a lovely bedroom, living room, and porch that was right on the beach. All meals were included in the cost of our accommodation, and on the first night we were shown how a traditional Fijian meal is cooked in the ground. There was a also another kava ceremony of which I did not partake - J did, and can attest that it tasted like "watered down" kava for tourists, while in the village we experienced the real deal! Today was a day for relaxing on the beach, swimming, more relaxing. As we sat on our porch in the late morning, one of the boys from the resort brought us over a coconut with the top cut off and we sipped the cool sweet coconut water. When we were done, he came back and cut it in half, and gave us two bits of chopped coconut shells as "spoons" so we could scrape out the delicious coconut meat. After another afternoon of relaxing and beach time, we got ready for the Summit Hike. Little did we know what we had gotten ourselves into! The activity board listed the hike up to a lookout on their property at $20 Fiji per person, as it required a guide due to the numerous trails and the ease of getting lost. It was just us plus an older couple from Switzerland. We were all geared up with our hiking boots and bottles of water, while our guide cheerfully hopped ahead of us on the challenging upward terrain in bare feet. It soon became apparent that there was no way I was going to keep up with him. He and the Swiss couple bounded up the hills at lightening speed, while I struggled way behind with the upward terrain, and J tried to stay in the middle of us, one eye on the guide, one eye on me, so that I knew where to go. The greenness of all the trees and plants on the hills against the backdrop of the ocean and shore views were beautiful, but I barely had time to look as I tried in futility to catch up to everyone else. Eventually the speed and terrain became too much for J as well, and the both of us lagged behind together while the other three sped far ahead. At one point in the bushes and tall grasses, we completely lost sight of them. I called out "Hello! Hello!" back and forth in the trails, not wanting to go any further on what might be the wrong path. Eventually the guide came back for us and stayed closer to us, as he had let the other couple continue on ahead of him. The hike felt never ending, but as we got closer and closer to the enormous rocks that were our goal, I started feeling more energized and excited about the view that awaited us. Finally we reached them, and our guide told us to "just go up". As in, there was no longer a trail of any sort, but you literally had to bare-handed rock climb your way up the giant boulders until you got to the top. This was actually a lot of fun, and I scrambled up the boulders ahead of J. The view from the top was nothing short of spectacular. The ocean stretched staggeringly all around us. We could see another of the nearby islands, Kuata, as if we were getting a perfect aerial shot from a plane. And the lush deep green of the island that we had just hiked through for over and hour and a half was breathtaking. This is the reward of hiking. Incredible views and the satisfaction that you pushed your body to its limits and succeeded at a challenge you've set for yourself. The five of us sat up there in silence and watched the sun slowly make its away lower in the sky. We hadn't realized we'd be here for sunset, but were pleasantly surprised that we had this extra reward. After enjoying the breathtaking display of colours as the sun dipped into the sea, it was time to make the return hike all the way back down. This was a part of the experience we had not anticipated. Welcome to hiking in Fiji, where we will take you up into the mountains on half-formed hiking trails that are slippery with rocks, unmarked, and require you to carefully clamber over giant boulders perched above impossibly high cliffs. Even though we are your guide, we will bounce along way ahead of you and disappear into the Fijian wilderness while you struggle to keep up. We will not give you any guidelines on what to bring, such as food, water, sturdy boots, or sunscreen, nor offer an explanation of the hike you are about to encounter, even if it is going to be an ardurous 3+ hour journey. We will not explain that you will be hiking back down in absolute pitch blackness, nor will we advise you to bring a flashlight or headlamp, so they will remain safely in your room while you scramble down the perilous trails without being able to see where you are going. It was certainly an experience we'll not easily forget. Our guide did indeed bring a flashlight with him, but as he was always several metres ahead of us, we could barely see him, let alone the trail in front of us. I tried using my cell phone as a dim light that would light up only the path directly in front of me, and J floundered ahead with no light at all, until one of the Swiss couple lent her one of their headlamps (how did they know?!) to use as a flashlight. This helped immesurabely, and J would go forward several metres, then pause and light up the path behind her so that I could see where I was going. We continued in this fashion for the entire hour or more that we hiked down, down, down the mountain, barely able to see where the path would lead and sometimes tripping over obstacles like unseen rocks or roots or vines, while our guide and the Swiss couple walked cheerfully way ahead of us. "Are they part mountain goat?!" I exclaimed to J on several occasions, wondering how they could possibly be matching our native guide's speed while we carefully tried not to get lost, trip, or fall off the cliffs. Finally, we made it to the bottom, where a delicious dinner of succulent rabbit stew and vegetables was waiting for us. Battered, scratched, exhausted, and dirty, J sat down at the table while I went over to the bar. "Two Fiji Gold," I ordered, and brought back our well-deserved cold beers, which we promptly drank after toasting to our incredible and insane hiking adventure to the peak of Waya LaiLai and back. The next day we had a very late checkout since the Yasawa Flyer only runs once a day and it stopped near our island at 3:45, so we spent another relaxing morning on the beach and then went for a quick free snorkeling session about a five minute boat ride away from our accommodation. It was my first time snorkeling, and I was fascinated by the incredible underwater world of coral and colourful fish that I was seeing. After that, we had lunch and boarded the small water taxi over to where the Flyer would pick us up, but the Flyer runs on Fiji time so we had a bit of a wait. Our water taxi left us on Kuata island's shore, where we walked around marveling at the pieces of washed up coral, shells, and the amazing purple starfish that I found. Finally we were able to board the Flyer back to Nadi, where we had booked an alternate accommodation after the cancelled JetSet fiasco our first night. This location, Bamboo, was considerably nicer than the first place we had stayed in Nadi, and we enjoyed the clean, well lit room and facilities, as well as our first HOT shower in over four days. We settled in for a good night's rest, excited for our flight to Taveuni, Fiji's "Garden Island", the next day. After a short flight to Nadi, Fiji, we arrived around 6pm as the sun was setting. Fiji airport is a chaotic but streamlined airport where people are rushed through bag pick up and security screenings in an efficient if overwhelming manner. There are plenty of people waiting at the exit trying to entice you with rides or bookings, but we brushed them off as we navigated our way through the throngs to a Yellow Cab that would take us to our pre-booked accommodation in Nadi for the night - or so we thought. We pulled up in the dark to the place we had booked through airbnb, JetSet Accommodation. Right away our taxi driver noticed something odd - the door was all boarded up and the entire place looked like it was under construction. Someone came out of one of the nearby buildings and spoke in Fijian to the taxi driver, and they discussed back and forth for a bit before the man turned to us and explained in English that the place was under construction and closed for business. Confused, we explained our airbnb booking. He said the person in charge should have cancelled our booking. When we explained that our credit cards had already been charged, he told us that he would pay for our accommodation that night elsewhere. Our taxi driver kindly agreed to drive us around to several locations nearby until we found one with availability, and then called the man back on his cell phone to come on over and pay the front desk. Our taxi driver was extremely kind and helpful, making sure to not leave us until our new accommodation had been confirmed and the payment made by the other man. We made sure to tip him extra! He could have easily left us stranded, but he explained that part of his training as a taxi driver in Fiji is to never abandon tourists who are in need and to do everything possible to make sure they are taken care of. We ended up in a room with three beds, which was a little strange but we assumed it was the only private room they had left. A very unexpected and mildly stressful surprise to encounter as our first Fijian experience, but our campervan journey got us used to unexpected events so we just rolled with it! The next morning we woke up bright and early for our 7:15am shuttle bus pick-up down the road that would take us to Port Denarau where we would board the Yasawa Flyer, a catamaran that makes daily stops to all the islands in the Yasawa region. After checking our large bags onto the boat, we quickly purchased several large bottles of water and withdrew cash before boarding the Yasawa Flyer catamaran to the remote Navotua Village, our first stop. We found Navotua Village on airbnb. The listing advertised a stay in an authentic Fijian village, and we selected it as our first stop because we wanted to be sure to experience the real Fiji, not just a commercialized resort experience. We were shown to our accommodation. We initially booked one of their "bure", but they had a full house (11 guests) and we got to stay in one of the villager's homes instead, who kindly prepared the private space for us while she and her family stayed elsewhere. It was actually a pretty neat unexpected change because we got to see what an actual home in the village was like on the inside, instead of in the bures which they built just for guests. After settling in, we were taken to meet the chief of the village, and presented him with a kava root, a custom for first-time guests in the village that we were informed of before we arrived. He said a prayer in Fijian and accepted our gift. It was very interesting to meet the chief and learn a bit about what he does, and how his position is passed down through the generations. Later on we also met the mayor, who is elected by the people of the village (there are about 80 residents in Navotua). After the ceremony with the chief, we joined the other homestay guests for an outdoor lunch. There was a plate of large, delicious tuna sandwiches made of homemade bread and tuna caught straight from their shores. It's hard to describe the experience of culture shock. We had just come from 25 days of living alone in mostly remote locations, and now suddenly here we were, not only in a village who's customs we didn't really understand yet, but also with other homestay guests from all over the world (France, Switzerland, Italy, even other Canadians), and it was all a bit overwhelming at first. I will try to convey my impressions as best I can, hoping that enough detail might give a small window into this life that is so different from the one that I know. After lunch, we had a liesurely afternoon trying to get acclimated to the village. J and I went for a walk along their beautiful beach, admiring all the beautiful shells and bits of coral that were along the shore, and ended up in a hammock afterwards, just laying and listening to the sound of the waves. In Navotua, all your meals are provided for by a different family. That evening, we entered one of the village women's homes and all sat on the floor for a simple but good meal of cassava, papaya salad, noodles with tuna, and crab. Some children were there as well, and it was really sweet to watch one of the little girls playing tickle and clapping games with another guest. After dinner, we lingered back talking with each other and with our dinner host, and one of the other guests wanted to try drinking their traditional kava drink, so we took one of the kava roots over to a large metallic pot, and took turns using a large and heavy metal rod to pound the root into powder. This was very difficult work, and one of the village men came over to help us finish it off. His very rhythmic pounding made the metal instruments ring out in almost a musical way, and as we all stood around this man in the pitch black night under a sky of thousands of stars, it felt like we were somewhere very far from home indeed. After the kava root was turned into powder, we brought it back to another village woman's home, who showed us how she put it in a cloth bag (to act as a filter), poured water in a large ceremonial bowl, and kneaded it over and over in the water in order to mix the kava powder with the water. The kava root powder mixed with water creates a clay-coloured drink that causes a calm, mild sedative effect that actually mildly numbs your tongue and throat for a few minutes, depending on how strongly it's prepared. As we all sat on the ground around the kava bowl in the dim light (they have some very limited electricity that is powered by solar panels as well as some generators), we were taught how to participate in the kava drinking experience. As you are offered the kava (served in a half coconut shell), you must first say "Bula" and cup your hands for form a clapping sound before accepting the bowl. You then drink the entire bowl at once without stopping, and after you hand the bowl back you cup your hands together three times in unison with everyone else in the circle. As we sat around taking turns drinking kava, more and more villagers quietly came in and were offered kava as well. J and I finally decided to go to bed while some of the others remained drinking late into the night. The next day after breakfast we went to The Caves, a volcanic island just across from us that has large caves in which you can swim. It was quite a disconcerting experience at first, to jump into a dark cave full of water, but there was a bit of sun peeking through a hole up in the top of the cave. After swimming around in there for a bit and enjoying the strange experience, we were guided to enter another cave that had a small opening you had to swim to. In high tide you actually have to dive under the opening, but thankfully (for me) it was low tide and you just had to dunk your face a little under the water in order to get through. The interior of this cave was completely pitch black, but our guide had a small light that made it mildly less frightening. After this experience, we took the short boat ride back to the village and had another very good lunch at another villager's home. There was rice, fried fish, and a very tasy split pea soup. J and I decided to go for a swim after that, to a nearby island. It was quite a fun short little swim, for at least one of us - J was not so enthralled by swimming through the super clear waters where we could sea sea creatures and plants below us. Thankfully for her, after we explored the island for a bit, Big Joe happened to be passing by in his boat and offered us a lift back to the village. Everyone in the village was extremely kind and hospitable. It was truly a unique experience to be immersed in their culture and their way of doing things - walking through the dark with a solar powered lantern, eating cross-legged on the floor, having the same kinds of foods that they eat from day to day, playing with the children. As we spent more time in the village, we started getting more comfortable with their rhythm of life, learning names and faces, and enjoying their well-kept little village. That evening, we had another lovely dinner at yet another villager's home. Their diet currently seems to be largely starch-based: the ever-present cassava, rice, noodles, plantains, and various flour dough based items. We saw on one of their community bulletin boards a village-planning list, with all their highlighted problems, and one of them was the lack of vegetables. When you're living in such a remote place with no real source of income and weather/water limitations on what you can grow, it must be a real challenge getting all the necessary nutrients into your diet. After dinner, there was some singing and dancing put on by the people in the village, and it was lovely to hear their beautiful harmonic singing and watch them immersed in their dances. I especially enjoyed watching one very young boy who was in the audience, who was trying to copy the dance movements of one of the older men! When the show was over, there was another kava ceremony, and people sat around and chatted with each other. The next day was our departure date, but not before we walked over to the school for a quick visit. As soon as we came in, a little four year old girl rushed over to proudly show us her worksheet. We took some time to look at all their learning materials on the walls, very similar to a typical western classroom. Then we spent a bit of time playing a number matching game with the same little girl from earlier. J looked just like she was back at work, sitting on the classroom floor (in her skirt! ), helping this little girl learn her numbers and giving her high-fives when she matched correctly. It's hard to sum up the experience in the village coherently. Everyone was incredibly friendly. People and children all called out "Bula!" in greeting whenever you walked by. The sweet young woman who's home we were staying in went out of her way to make sure we were comfortable, and during the last kava session it was very interesting to talk a bit more with her and find out some details about her daily life - how she doesn't like waking up for church, how she needs a "chaser" after she drinks kava, etc. Really, just like any other 23 year old! Things were different than our own lives. For example, it was strange to live in such a close community where homes are always open and there doesn't seem to be much opportunity for privacy; they have one dwelling for sleeping and living in and a different unattached one for cooking in. But it was an interesting juxtaposition to experience some familiar aspects of life thrown in with the foregin - for example, to be in the home of someone who didn't have electricity but had a cell phone, or to watch a little child who has likely never seen a television nevertheless singing "Mama Mia" impishly at us because a volunteer in the village once brought a portable DVD player and that was the only disc he had. It was a very overwhelming experience at first, trying to get used to what their customs were, and what was acceptable and what wasn't. Sometimes we just watched; other times we had to ask. But as the days went on, we started to feel more comfortable. It was only two days, but we both wished we had stayed longer. There was something very genuine about their friendliness, and something wholesome about staying in Fiji with real Fijians instead of in a commercial resort. We were directly benefiting their small community and providing them with one of their only self-sustaining sources of income. We left reluctantly, back in Big Joe's boat with a bag holding a kindly prepared packed lunch of fruit juice and roti. If you ever go to Fiji, go to Navotua. I would almost even say, don't stay anywhere else. If you just want sun and sand, there are plenty of places in the world you can go to. If you want the real Fiji, Navotua is it. Go, and give them a friendly "Bula!" from us. We woke up to a rainy, misty morning with constant strong gusts of wind, but that didn't stop us from preparing a bacon and egg breakfast at the back of the van. We were lucky enough to enjoy another incredible rainbow with us all morning long as we got ready to leave and head towards Christchurch for our final drive. We took the scenic route, stopping at several lookout points along the way as we said goodbye to the incredible mountain ranges. I drove for the first 200km or so, my second time at the wheel and my first taste at some of the crazy windy narrow roads that are all over the country. It felt a lot more comfortable my second time around! On the way out of Mt Cook, what J has wanted to happen this entire trip, finally happened - we had to stop our car on the highway due to a sheep crossing! We arrived in Christchurch mid-afternoon, selected a campsite with full facilities as we needed to do laundry, and went for a short walk to see a little of the city. The part of the city we saw was one of the parts affected by the earthquake back in 2011, and it was strange to see entire streets still closed up and most of the area in a constant state of construction. Someone told us that when the rebuilding first started, they had to fix everything that was underground first - all the plumbing, etc., and only recently has that all been done and they can finally start working above ground. I had checked the geocaches in the nearby area because that's my first go-to for getting tips on what to do in a new city, and saw that one of the ones with the most favourite points was a temporary art installation regarding the earthquake, so we decided to go and have a look. The installation was 185 unique chairs all hand-painted white, to symbolize the uniqueness of the 185 people who were killed in the earthquake. There was a sign explaining the installation, along with the names, ages, and countries of the people who died. The public was invited to sit in any of the chairs that they were drawn to, and to leave comments in a guestbook. It was a very moving piece of art, and really helped to make a little bit of contact with how hard the city was hit and how many lives were affected. It was also a very powerful reminder that earthquakes, floods, and other forms of natural devastation happen all over the world, to hundreds and thousands of people, who often live in places that don't have the infrastructure or finances to rebuild and recover in the same way that Christchurch has been able to. Being in this city at the end of our 25-day journey through New Zealand made me reflect on the fact that life on this planet is more fragile than we sometimes realize in our sheltered western world. Many of the locations that we visited throughout the country were conscious of the limited resources they had. Even in remote campsites, people are encouraged to recycle everything they possibly can, into well-labelled bins, or to carry trash out with them, as the fuel it takes to transport garbage out of inaccessible places like Milford Sound means they try to make as few trips as possible. All power outlets have an on and off switch, so that even plugged-in electronics/appliances/etc are not draining any minute bits of energy, and are only switched on when needed. Places that are heated or have hot water often have these on a timer or a motion-senser. And of course, conservation efforts of the native flora and fauna are everywhere. The indigineous culture (Maori) is also embedded right alongside European culture in a fascinating way that does not seem to exist anywhere in North America that I've been. I don't know the entire long history of them Maori's interaction with Europeans or what struggles I'm sure they've had to overcome and still need to overcome, but it was still very inspiring to see that any informational sign all over the country was written in both English and Maori, and that official names of places often include both the Maori and the European name (for example, the official name of Mt Cook is actually Aoraki/Mt Cook). It was also really interesting, as we hiked and visited the various geological and cultural areas of the country, to see that all informational signs regarding things like flora, fauna, glaciers, lakes, etc., include the Maorian explanation of their creation right alongside the 'scientific' one, and are given the same visual importance (equal size of text and space shared on the panel, instead of just a small footnote, for example). Important spiritual locations of the Maori are respected, with signs telling visitors not to eat in those locations (like Cape Reinga), or access to those locations for spiritual or cultural purposes still being given to them (for example, the Maori traditionally used the hot waters near the geyser we saw in Rotorua as a swimming area, so when the geyser park closes for the day, the people of the nearby village are allowed to enter the park and still use the waters as they traditionally did). From the majestic mountains, to the stunning oceans, to the incredible hiking trails and native wildlife and everything in between, the 5038km that we spent driving through this country has been full of more memories, first-time experiences and once-in-a-lifetime moments than I can possibly list. I could have easily kept traveling - just me, J, 1997, and the endless road of discovery ahead of us. For New Zealand has a hold on me. Often when I travel, I know I am seeing incredible things and places that I will likely never see again. But I can't possibly imagine that for New Zealand. I don't know when, and it likely won't be soon, but I know I will return here. I will once again walk the deserted sands and splash in the crashing waves of Ninety Mile Beach; spend misty nights atop volcanoes; see the little lambs leaping over the rolling green hills; hike amidst the breathtaking scenery of Cape Reinga; climb the Moeraki boulders once more. This country no longer seems like a faraway dream. It seems like a place I intimately know. A place that it takes simply a little longer to get to than other places. So I won't say goodbye. I'll see you again one day, New Zealand. I'm sure of it. After a quick morning walk to check if the little penguins were still there (vanished without a trace), we spent an hour or so walking around Oamaru's Victorian-preserved part of town. It was interesting to see all the old buildings from the 1800's still in use. Some of the businesses even thrive on the Victorian-era theme, offering services like good old-fashioned book-binding. It was very interesting to walk into all the antique and artisan shops, and I spent a good while looking at some of the old books. We stopped in Deja Moo, a delicious ice-cream parlour where we some unique ice cream flavours. We walked around a little more with our cones and saw some steampunk art sculptures and themed playground as we made our way back to the car. Finally, after many changes in itinerary, we were headed to Mt Cook. On the way we encountered two spectacular lakes, Tekapo and Pukaki. The views of the mountains and the magical blue of Tekapo were incredible, but when J turned a corner and Lake Pukaki came into sight for the first time, I couldn't help but cry out in wonder. We had read a blog prior to coming here about a guy who said the first time he saw Lake Pukaki, he screamed like a little girl, and I suddenly understood why. The view is beyond describing. Large grey and snow-capped mountains are suddenly right there in front of you, bordering the spectacularly turquoise-coloured waters and reflected off the water like a mirror. We had seen many mountains and many lakes on this trip, and many of them together, but absolutely nothing rivals the impossible beauty of Lake Pukaki. Yes, the water really is that colour in real life. But pictures don't do it justice. The immensity of the mountains, RIGHT THERE, is not an experience I can describe to you in words nor show you in pictures. You just have to be there. To highlight how impossible it is to find words to describe it, I'll share a quote from J: "It's the bluest blue of the blues!" J was on cloud 9 with giddiness and visibly bouncing with happiness whenever we were in sight of this lake. We drove north along the eastern side of it for a bit, first going to a lookout point and then, to chose what may be my favourite campsite of the entire trip. An entire shoreline of incredibly large and private areas directly on Lake Pukaki was there for us to chose from. After a bit of driving up and down, we finally chose our favourite spot, and pulled in for the night. We got out our camp chairs and set them up by the shore of the lake to watch the sunset, which was quite obviously spectactular. After the magical colours faded, I lingered in my seat, staring at the fading colours, the looming mountains, and the impossibly-turquoise water. Being in the presence of so much natural beauty made me feel suddenly and overwhelmingly small. My thoughts turned deeply inward, and I started thinking about everything in my life that had led me to that moment. What led me here was nothing different than what leads anyone anywhere in life: a winding, unsure path of wrong turns, self-discovery, various griefs and joys, broken and rebuilt identities, loneliness, mistakes, happy accidents, incredible friendships, loss, misunderstandings, empowering decisions, and so much joyous and terrifying risk-taking. It's easy for me to get lost in this kind of thought, but I pulled my eyes away from the sky and the mountains and looked over at J sitting next to me, and we both decided to finally head "home" for the night, to our cozy little sleepervan. The next morning brought new beauty and surprises. As J put it, "It's not every morning that you wake up to pink mountains, turquoise waters... and a man with a pony." Indeed. As I pulled back the curtains and saw the sunrise had turned the mountains a gloriously bright pink, I gasped and woke up J to make her look out the window. "Pink mountains!" I exclaimed. "Oh, and... a pony?!" J sat partway up. "There's a man with it, too!" Sure enough, there was. The straw-hatted lounging man and his pony appeared to be enjoying a quiet morning watching the sunrise, and after the colourful display was over, he and his pony were on their way, again leaving us to our solitude by the lake and mountains. The weather was rainy, but we didn't mind at all because it meant we got to eat breakfast not only with majestic mountains by a turquoise lake, but with an added rainbow that lingered all morning while we ate. Eventually we set off down and around Lake Pukaki to take the road up north on its western side towards Mt. Cook National Park. On the way we made a quick stop at Mt Cook Alpine Salmon, a tiny salmon sashimi booth that sells nothing but that. J bought a 100 gram package of the most delicious salmon sashimi I've ever had, and I'm not even a sushi person. The freshness of the salmon was an incredible dance of flavour that, if you are ever in the area, should not be missed. It was even rainier and colder in the shadow of the barely-visible Mt. Cook, but that never stops us. We just put on more layers, armed ourselves with our bright red rain ponchos, and off we went on a 40 minute hike to the Tasman Glacier. The trail is currently under construction, meaning we had to navigate slippery half-finished wooden planks that would eventually be stairs, sliding mud and rocks, and extremely spiky green plants on a haphazardly-indicated makeshift path that zigzagged up to the view at the top. There was no real good way to get to the top - as J put it, "Pick your poison". Nothing deters us from our hiking goals, however, so we trekked it up to the top as best we could, admiring the Tasman Valley views behind us, the magestic snow-covered mountains completely surrounding us, and the strange vegetation and plants all around us. J got to the top a minute or two ahead of me, as usual, and called down to me "Don't cry!" When I joined her at the top, I saw why. "Where's the glacier?!" I exclaimed, The glacier was nowhere to be seen, and there was a plaque that identically echoed my cry, with the heading "Where's the glacier?" While the glacier is indeed technically there, at only 24km long (in 2011) it was barely visible through the mist, and is shrinking rapidly at 480-820m per year. I didn't cry, but I was close to it. It's a very unique kind of sadness, to be face to face with something that is immensely disturbing and completely out of your power to stop. We both looked down in utter silence at the rapidly growing lake of melted glacier, and the small floating bits of iceberg that will soon join the meltwater. We have seen so much incredible natural beauty in New Zealand, and have learned so much from signs, guides, and pamphlets about the various conservation efforts all over the country to preserve this beauty and the fragile plant life and creatures that live in it, and the successes they have had. It's very difficult to come face to face with something that small localized efforts cannot possibly stop: the warming of the planet. It was a sobering reminder of how fragile our entire existence on this planet really is. That evening, we rewarded ourselves after our cold and rainy hike with a rare treat: dinner in an actual restaurant instead of cooked in the cold at the back of our sleepervan. Mt. Cook National Park has a small village in it with a few restaurants. As we pulled up to Old Mountaineer's Cafe, we realized that we hadn't been in civilization in a while, and quickly tried to brush our hair, put on perfume and change our muddy pants in order to appear presentable enough for eating out! We enjoyed a delicious ginger-pumpkin soup, salmon pizza, and chocolate cake with ice cream with beautiful views of the mountains from the large glass windows, before heading back to our van to sleep in the shadow of Mt Cook and the other majestic mountains to the soothing sound of the rain outside.